Learn about the basics of macronutrients—carbohydrates, fats, and protein—how to count them, and how to successfully lose weight in this new guide! Are you trying to diet but still get tempted by a slice of pizza or a juicy burger, knowing you won’t be able to say no? By following a macronutrients plan, you can have your favorite foods without ruining your diet. Carbohydrates, proteins, and fats are three of the most important nutrients found in food. With this guide, you will learn the importance of these essential elements and how to control them to be the healthiest you can be—and still eat what you want! 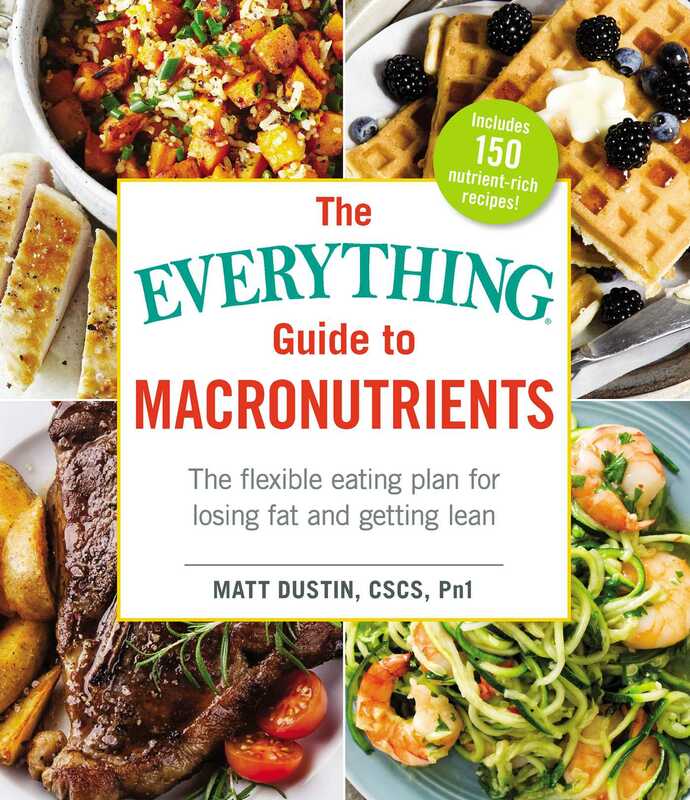 The Everything Guide to Macronutrients will teach you how to count macronutrients, giving you a more flexible and less stressful form of dieting. You’ll learn how to incorporate your macros into your meals, allowing you to focus more on the essential nutrients and foster healthy eating. With more than 150 recipes and a two-week meal plan to get you started, this book is a comprehensive yet approachable resource that gives you all the tools necessary to help you lose weight more effectively—and keep it off. Matt Dustin, CSCS is a personal trainer, author, and online fitness coach based out of San Diego, California. In addition to earning his bachelor’s degree in exercise science, Matt is a certified strength and conditioning specialist, and a precision nutrition coach. He’s been training clients since 2011, and has worked with high-level athletes, models, actors, CEOs, and everyone in between. Matt is the author of The Everything Guide to the Carb Cycling Diet and The Everything Guide to Macronutrients, and he’s been featured on AskMen, T-Nation, Bodybuilding.com, Sports Illustrated, Muscle & Strength, and many other publications.